Kahles claims to be the Rifle Scope Pioneer, we check out one of their latest to see if it lives up to the claim. Any scope manufacturer that bills itself as the “Pioneer of Rifle Scopes” is going to catch our eye here at Sniper Central. 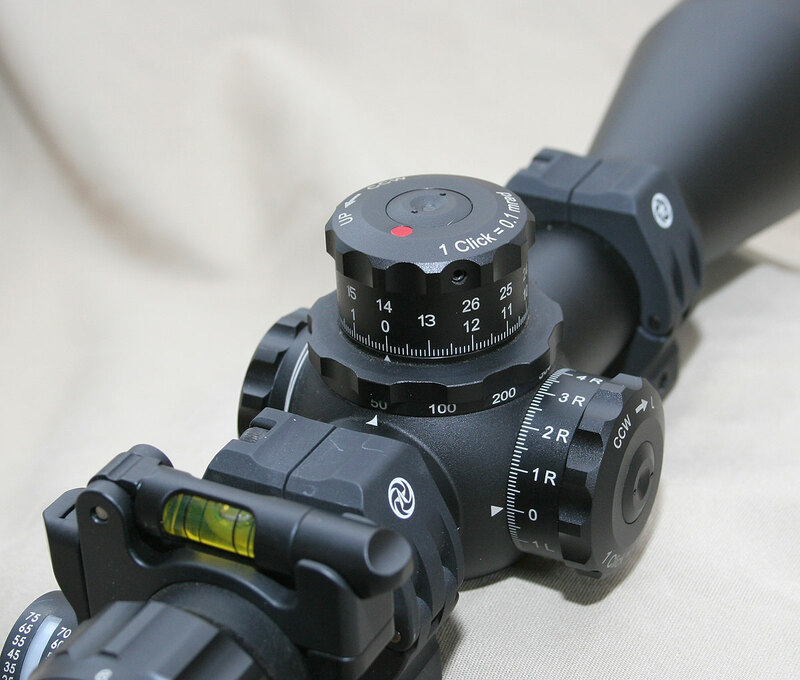 Kahles is an Austrian based scope manufacturer that has been around since 1898. In fact, that makes them the oldest rifle scope manufacturer that is still in existence and is one of the reasons why they are claiming to be THE rifle scope pioneer. But to us, just being the oldest does not entitle you to being THE pioneer, it takes continued innovation and leading the industry in ideas and creativity. Is Kahles still the rifle scope pioneer? That is what we are here to find out. 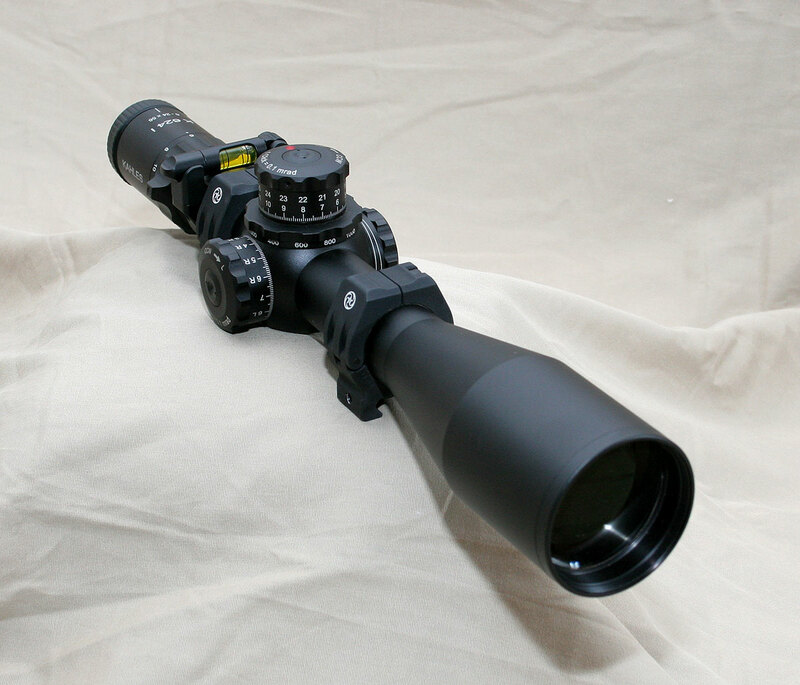 To do that, we have brought in one of Kahles’ latest tactical rifle scopes called the K624i. A reader and friend of Sniper Central was kind enough to let us use his scope for this review and we are grateful to him for the opportunity. Because this scope is owned by someone else, we have left the rings and cosign indicator on the scope for the pictures and evaluation. A quick glance at the scope reveals that the K624i scope falls into the “large” category of tactical scopes and it would also be categorized as very high end with a price tag just under $3000 USD. It is also apparent when looking at the knobs that there are definitely some interesting differences between this scope and the other scopes on the market. It was these differences that first piqued our interest in the K624i. As is traditional for European optics, the Kahles arrives in a plain and simple box with not a lot of markings. It seems the big fancy boxes and cases with elaborate designs are reserved for the scope manufacturers that are trying to make a good first impression. It seems that the very high end scopes have nothing to prove with a box and just allow the scope to do the talking, we like that. 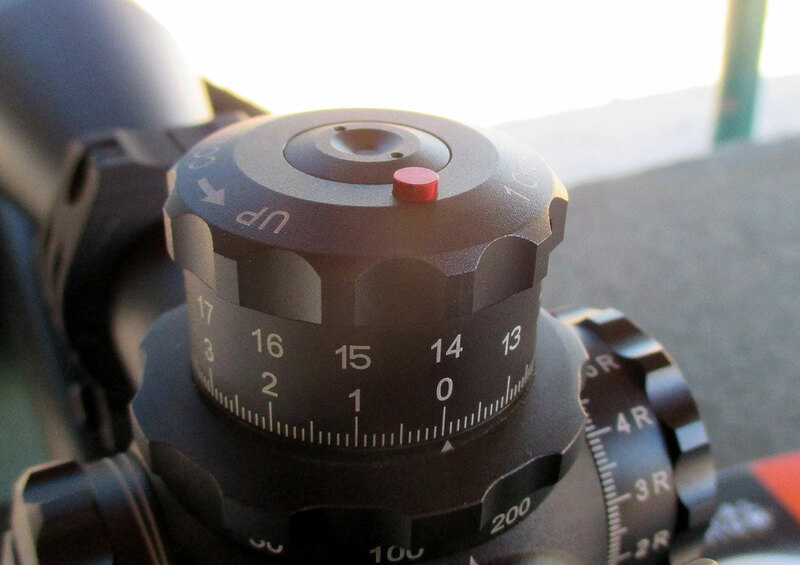 Starting at the eyepiece, there is a rubber ring on the end of the ocular lens, which provides both a gripping surface to adjust the dioptre focus of the eyepiece as well as provide a cushion should you allow your rifle to give you a scope kiss during recoil. 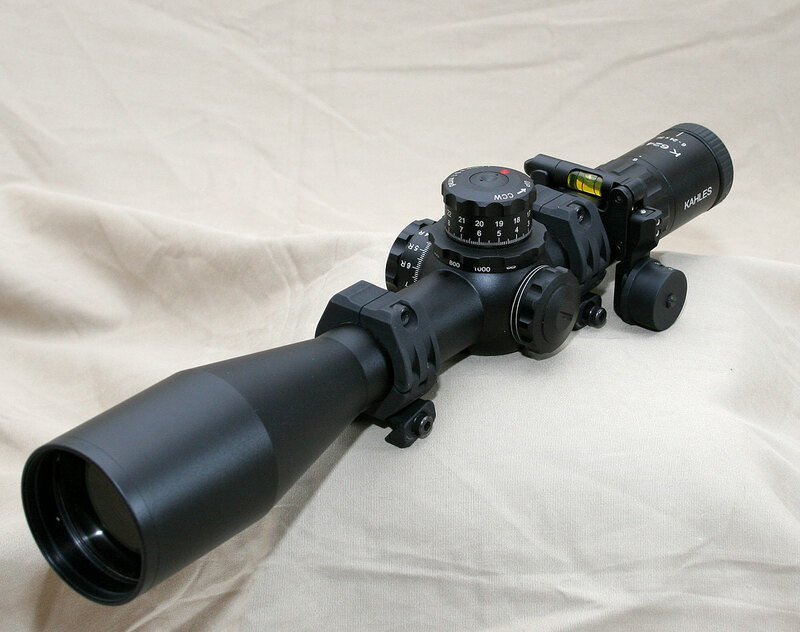 The eye relief is a respectable 3.5″, enough to allow use on most all high powered rifles, but it is not as large as some of the other tactical scopes available. The dioptre adjustment itself is a fast focus design with the entire adjustment range being covered in about 1.3 revolutions. Other scopes do it in less amount of revolutions, but this seems to be a good compromise, allowing precision, yet providing a rapid adjustment. The amount of effort required to rotate the eyepiece is stiff enough to keep it from inadvertently moving and it is smooth through the entire range. More importantly, when the eyepiece is adjusted all the way out, there is zero movement of the extended eyepiece. This is a very good sign of quality and is where cheaper scopes show some weakness. Directly in front of the eyepiece is the magnification adjustment ring which has some larger knurled bumps, with nicely smoothed edges, and a larger protruding finger knob to allow for better grip. This extra grip is needed because the smoothed edges of the ring make the knurling a bit slick on their own. The resistance is also stiff enough that the ring does require a some force to move. It is very smooth through the entire adjustment range with equal amounts of force being needed regardless of where the power is set at. There are clear markings on the power ring indicating many of the major powers from 6-24x. As the magnification goes higher the numbers are closer together, which is normal on scopes. The markings are not tilted toward the shooter, so you need to raise your head a decent amount to see what power you are at when behind the scope. 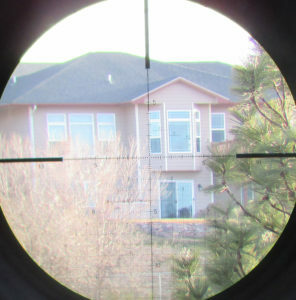 Because the scope is a First Focal Plane (FFP) scope, this is not a concern as the reticle will be accurate no matter what power the scope is set at. 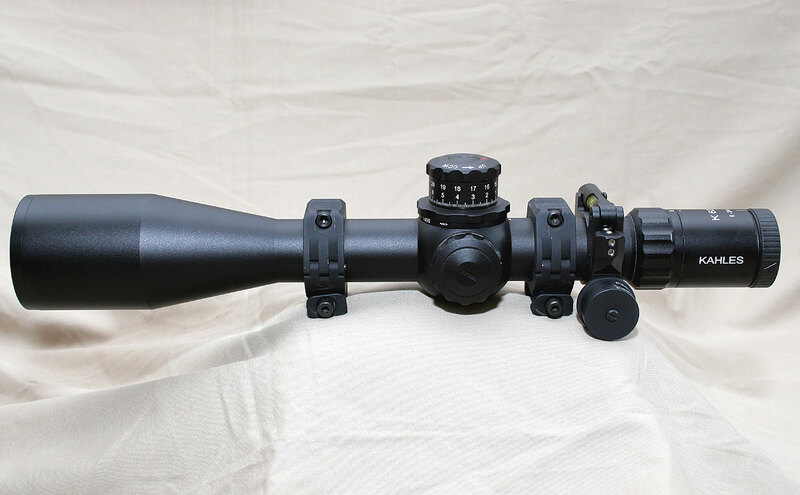 The K624i has a 34mm tube, which is becoming the more popular choice for the high end large tactical scopes, and in front of the eyepiece there is a good amount of space for ring placement and mounting along the tube. At the midpoint of the tube there is a large shoulder area where the primary controls of the scope are located and this is where things start to deviate from a traditional scope as some of these controls are not standard, in fact, they may even be considered pioneering. We will start with the control on the left hand side of the scope where the traditional side focus is located, but in this case, it is not a side focus but rather the rheostat for the illuminated reticle. In this particular case, it actually is a true rheostat and does not have a set number of brightness “clicks”. Instead, it is a smooth control from the off position to the brightest with an infinite amount of brightness settings along the way. The more you turn it clockwise, the brighter the reticle becomes. The entire range from off up to full bright is covered in about 2/3 of a revolution which allows for plenty of brightness levels. It is simple, easily accessible, and extremely functional. The force required to rotate it is lighter than the power magnification ring and again, it is very smooth through the range and there is a slight detent in the off position. So if the focus is not located on the traditional left side, and it is not located up on the bell, and it is not located at the rear, then where is it? I suppose this is where some of the “pioneer in rifle scopes” comes into play. The adjustable objective, or focus, control is located under the elevation knob. If you look in the pictures you can see the short and flat control knob under the elevation turret, this is the adjustable objective. The knob is marked from 50 to 1000 meters and then infinity. The diameter is wider than the elevation knob and there are some large knurling indention to help provide a good gripping surface when adjusting the focus. The full range takes about 3/4 of a revolution and there is a good amount of adjustment range to allow precise focusing. There is an indicator mark down below the knob up front to allow a reference point. The knob rotated smoothly and while we originally though it would be awkward to adjust while behind the rifle, it turns out it is not. As snipers and shooters, we are already used to rotating the elevation knob with your hand and it is the same motion to use your non firing hand to focus the scope. The location and size are drastically different than the elevation knob so it is very easy to locate by just feel while keeping your eye behind the scope. The only down side is that the markings get hidden behind your mounting rings, but this usually is a non issue as you simply adjust the picture until it is sharp and clear, the markings only give a rough reference point. Directly above the focus ring is the elevation knob. The size is fairly large with a nice amount of surface area for the markings. There is knurling on top to provide a gripping surface to help grab the knob. Each click is .1 MIL and there are a full 14 MIL of adjustment per revolution. This is enough elevation to take a 308 shooting a 175gr Sierra Match King bullet at 2600 fps from 100 to 1100 yards (or 1000+ meters) in a single revolution. In the event that you do need to go beyond one revolution, the scope has a zero stop to allow you to come right back to your original zero easily and quickly. On top of that there is a second revolution indicator on top of the scope that pops up to indicate when you have gone past a full revolution. The indicator is a red protrusion the pops up as seen in the picture below. The clicks themselves are a good firm click with a muted audible click and a nice tactile feel, certainly one of the top click feels out there. The markings are clear with each .1 click having an individual mark and each whole MIL getting a number. The numbers are marked all the way up to 26 with the markings moving on top of the first row of numbers once past a full revolution. That 26 marking is significant because that is the full elevation range of the scope, 26 MIL, or 90 MOA. Of course, to get that full 26 MIL, the mount would have to be setup just perfect to allow your zero to be right at the bottom of the adjustment range. This is doable, but tricky. The 90 MOA is a good amount of adjustment for most shooting conditions, but if you are planning on operations where extreme ranges may be encountered, it may not be enough without a 40 MOA canted base or something similar. The windage knob is the same general shape and design as the elevation knob, but not as tall. Each of the same excellent feeling clicks again represent .1 MIL and there is the same 14 MIL of adjustment per revolution. The markings count up in both directions with a R or L next to the number to indicate either right or left, we like that on windage knobs as it makes it very easy in stressful environments to know exactly which way to adjust the knob. It is also a great indicator as to which way the windage already has been adjusted. With 14 MIL of adjustment in one revolution, this means the markings overlap at 7 MIL, which is enough windage to shoot our same 308 Win in 10mph crosswinds out past 2000 yards/meters without an overlap. Or, in a 20 MPH wind out to 1100 yards/meters without overlap. That should work very well. In front of the control knobs is a good length of tube to provide ample mounting space for many rifle and mount configurations. The 34mm tube then tapers into the bell that houses the 56mm objective lens. The scope is just under 16″ long and weights over two pounds, so it is neither small nor light. The matte black anodizing is excellent with an even and thick application throughout and it should hold up well. The markings are done in an off white color and are clear and not excessive. The overall look of the scope is of a very purposeful tactical scope. There are several reticles available in the K624i and the one this scope has is the AMR, which is a Christmas tree style reticle made popular by Horus. These reticles are very busy with lots of lines and dots and while they can be distracting and even make seeing details in a target area a bit more difficult, they do work well when it comes to holding off for wind and elevation quickly. The AMR reticle also has a quick reference ranging scale in the upper right quadrant. This scale is used to measure a 1 meter tall portion of the target (or 1 yard tall if you are working in yards) and match it up to the scale and it quickly tells you how far the target is away. While this scale can be handy, it adds yet more markings to an already busy reticle. The hash marks along the stadia lines are excellent and easy to read with little hash marks at the .2 MIL intervals. 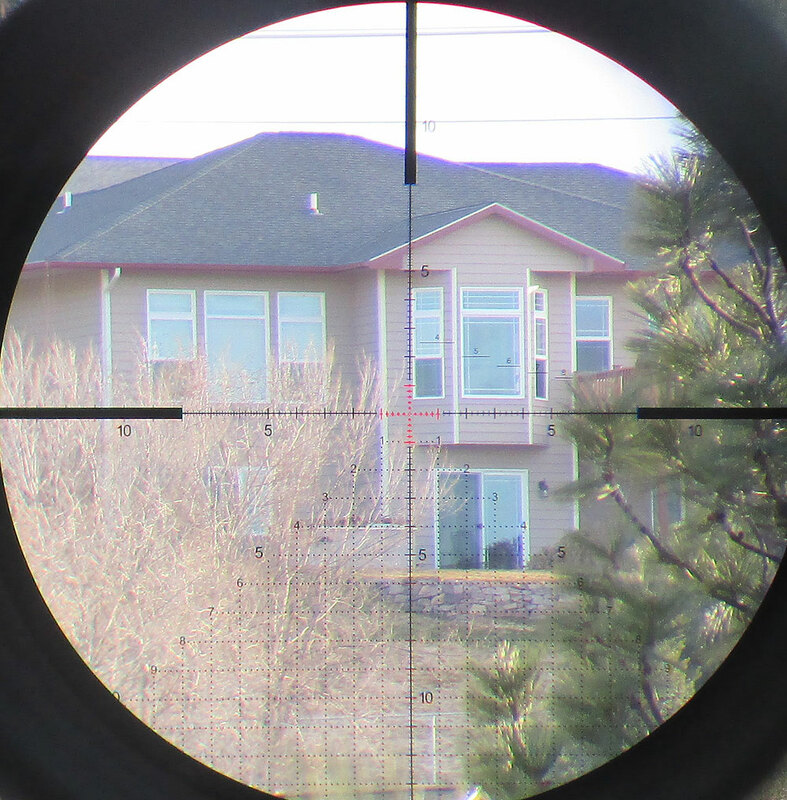 The reticle is located in the first focal plane (FFP) which means it grows and shrinks with magnification. With such a large range of magnification the FFP reticle means that down at 6x some of the detail can be lost. But Kahles has done a very good job with adjusting the size and thickness of the reticle to allow good detail at all magnification levels. This is not easy to do for a scope maker. The illumination of the reticle is quiet interesting as the critical center portion of the reticle actually illuminates brighter than the rest of the reticle. The entire Christmas tree portion of the reticle, as well as the full length stadia lines, are illuminated, but it is a very dim illumination. It is a clever idea, but the downside is that the center portion gets very bright when the brightness is adjusted to levels where the rest of the reticle is visible. That high level of brightness can drown out target details in low lighting environments. Typically you want the illumination to be just barely on so as to not drown out the target area. The adjustable rheostat on this scope is good for getting whatever brightness you want and it works great if you are just using the center portion of the reticle. But if you want to make use of the entire reticle, I think having the reticle a uniform level of brightness might be a better option. The optics on the scope are excellent. Very bright and sharp from edge to edge with no distortion and great light gathering ability. The high end German made glass in scopes like Kahles, Schmidt & Bender, Steiner, Zeiss, Hensoldt is just wonderful. We could not find any fault in the glass and give it a ringing endorsement. For our mechanical functional tests we ran the scope through our typical battery of tests, both shooting and using a bore sighting device. 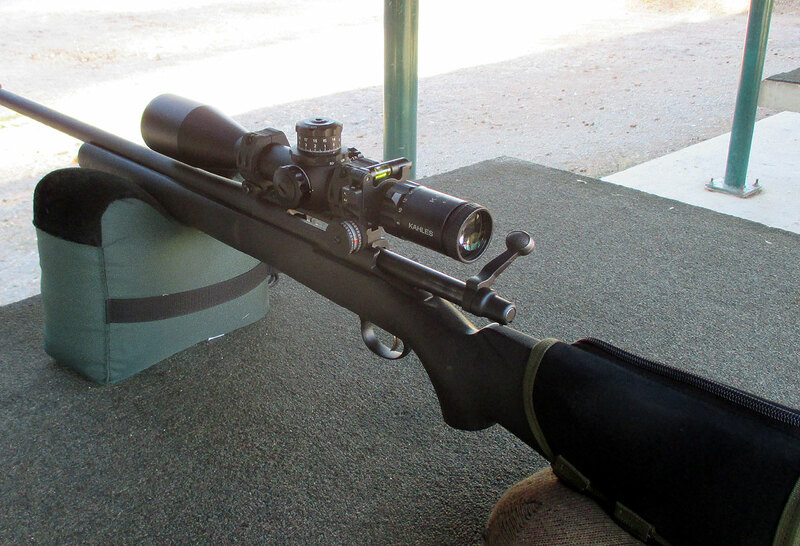 We used the already mounted rings and mounted the scope on our 700P test mule rifle and headed out to the range. The standard test that everyone does is ‘shoot the box’ where you put a group at each corner of a box using the same aiming point and using only the adjustment dials on the scope to move bullet impact. You followup the four corners with a fifth group which should be right on top of the first one. The box shot great, as you might expect, without any issues and it measured the proper size. The adjustments also came right back to the original group location as the first. Anymore, even the low end scopes will shoot the box without too much trouble, though we occasionally see the wrong size of clicks, which is why we do the click size test. This is done by shooting one group, then adjusting 6 MIL to the left, fire another group, then come back to the original setting and fire a third group. The third group was right on top of the first, as it should be, confirming again repeatable adjustments. We then measure the distance from the center of the first and third groups over to the second group to get a measure of the adjustment range. The test is shot at 100 yards and so the distance should be 21.6″ from the center of one to the center of the other. Because group sizes very, there is some error in exact measurement, so we allow some amount of error. Anything within 5% error we consider passing, anything under 3% is considered right on. The distance between the groups on the Kahles was 21.69″ which equates to 0.4% error, which obviously falls well within our range and we consider it excellent! One of the more recent tests we have started doing on scopes is testing for reticle shift while adjusting the adjustable objective through the entire range as well as testing for reticle shift when adjusting through the entire zoom range. Both of these tests show surprising results on scopes that do not have internal mechanisms made to the highest standards. Even the highest quality scopes will experience some minor reticle shift, especially with the adjustable objective, and lower end scopes can be really bad. There are limits to what can be done with machining, and then when you magnify it to 24x and everything, including imperfections, are magnified. We like to see under half MOA of shift from one extreme to the other to be considered acceptable. Of course, smaller than that would be even better. We measure the shift by using a boresighting scope, which is mounted on the front of the rifle via a high powered magnet, and then align the reticle on the center cross-hairs using the internal adjustments of the scope. We then measure the movement of the reticle off of the center cross-hairs of the scope as we go through the entire range. With the Kahles, we started with the zoom test and it was rock solid with well under .1 MIL of shift between 6x and 24x, which equated to less than .25 MOA. Next was the adjustable objective and again it was rock solid with less than .1 MIL of movement. In fact, we were unable to really measure the movement it was so small. These are fantastic results and should give the sniper confidence that no matter what the scopes controls are set to, the zero is going to remain in place. Shooting in low light as well as at mid to long ranges are no problem with very good light gathering and definition. We only fired the scope on a 308 rifle without major recoil so the somewhat limited 3.5″ of eye relief was no problem. A lightweight big boomer like a 338 Lapua or 300 Win Mag might be close, but typically 3.5″ should be enough for most tactical rifles and proper shooting technique. One thing we didn’t really care for was the four dots at the center reticle with a hollow dot in the middle. When doing our shooting tests we noticed that the four dots would cause the eye to loose its focus on the target and the center hollow dot was invisible. It was an interesting phenomenon. We especially noticed it when shooting at 1″ orange dots at 100 yards, the orange circles have a small black dot in the middle. With the scope properly focused, the black target dot is visible in the scope picture until you go and put the reticle over the orange circle, the center black dot would disappear as the eye focuses on the four reticle dots. It did not hinder any capability, but it was a distraction until we got used to it. Overall, the scope is excellent. We would have no reservations using it on any of our tactical rifles. Kahles claims to be the rifle scope pioneer and we do have to admit that they have some pioneering features on the K624i, primarily the focus knob location. It works surprisingly well and was easy to adapt to. It also needs to be mentioned that the scope can be ordered with the windage knob on the left hand side and the reticle brightness rheostat on the right, opposite of normal. 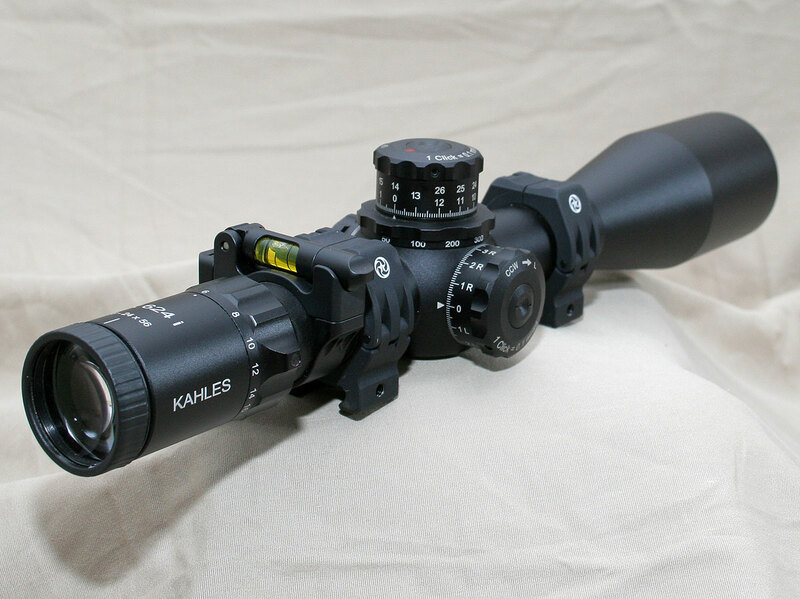 We suspect some of the other high end scope makes would do the same, but we are comfortable in saying Kahles is one of the few that offers this as an option. The price is high, but the quality comes with it as well as some pioneering heritage and innovation. Excellent read! As I consider myself a novice with scopes, this was a learning experience. I’ve called this style reticle a ‘Christmas tree reticle for years, having no idea it was actually called that. Great test love the site great information. Don’t forget the SKMR reticles in the Kahles line. Useful and not as busy as the Christmas tree model as found in your test sample. Rob Carson..most companies like S&B, Leupold, Nightforce ..exaggerate low and top end zoom. Kahles is not one of them. 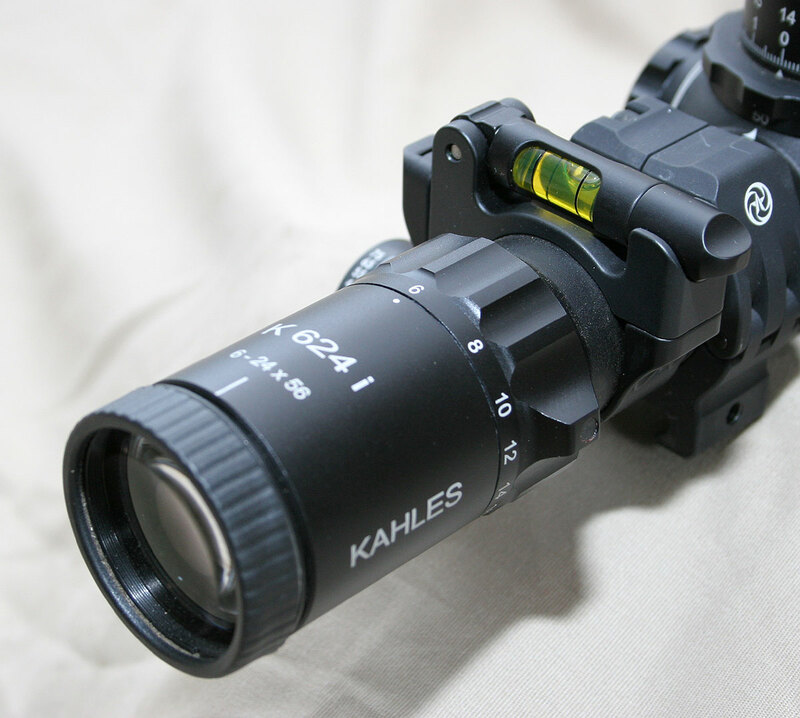 Kahles 24 is more in the range od 24.4 -24.6 (S&B, Leupold ..etc would mark that as 25x scope). Contact us via email or phone and we can order one in for you. i would like to purchase one as well. as well as the level and cosine indicator (setup as shown in this article). if you could email me, that’d be great. Well written review, thank-you. What is the typical wait time upon ordering? do have any idea of this scope being used by Armed Forces !!!!!!!!! While the scope is very capable of military use, I am not aware of it being adopted as a standard scope for any military sniper rifles. I do not know of it being adopted by Armed forces either, but Brugger and Thomet chose this scope as the standard on their APR line of sniper rifles… Previously they were fond of Schmidt and Bender if I remember well. The Brits had one on a mcmillan tac 50 snapped a photo of it pretty sure its 624 had the msr reticle. Mel thanks for giving my scope a going over. I have now used this scope at 4 of your classes , 1 comp. and various range outings. I have had it on .308 and .300win. and I have had zero issues . I am looking forward to your classes this summer with this scope. Thanks for selling me this great piece of kit. Thanks Conrad for the input and followup information! We look forward to seeing you again at class! Hi. Very good review. Kahles is the Austrian Army official issue for theirs sniper teams. In Europe Kahles is teamed with Ruag known to be the best ammunition’s factory for SOF in the old continent.It’s true that Brugger & Thomet are supplying Kahles scopes with their very good rifles to law enforcement and Army teams. The Brits love these scopes and the IOR Valdada. Thanks for your nice job. Take care. I’ve been using the 624i exclusively this past year, on Sphur mounts atop a Sako TRG M10 barrelled with 300WM, so kicked regularly. The mechanicals and glass is truly fabulous, and ladder tests come straight back in time after time. I’m using the MOAK version as UK ranges are generally quoted in yards, otherwise an FMS setup. I steered away from S&B as I really couldn’t justify the price with the Kahles more than its equal IMHO, and you will pay a handsome premium for brand name alone, and Kahles don’t appear to market themselves so aggressively. I cannot recommend the Kahles 624i enough. In this moment there is a new flag ship of the Austrian riflescopes manufacter Kahles, the Kahles K525i. Please, could you review it ? Good evening, Would it be safe to say that the Kahles 5-25i scope is of equal quality? I always enjoy reading your reviews. This is the case for any scope. The point I was trying (probably poorly) to illustrate was that you cannot just look at the max elevation range (in this case 90 MOA) and assume that you would have a full 90 MOA to use for elevation adjustments. Because the scope comes centered with 45 up and 45 down, with a flat base you would only have around 45 MOA of adjustment. So, to get a full 90, its is nearly impossible since there is fudge factor getting the 100 yard zero, etc. The scope is extremely capable, an excellent scope, but if you want to do extreme range shooting where you might need more than 80 MOA of up elevation to get way out there, the Kahles may not work for you. But if you put a 30 MOA rail on it, you would have about 70 MOA or so, and that is enough for a vast majority of shooting, including just about all tactical shooting.